Hiromori Uchida will be performing how to make wagashi on Saturday, September 9th, 3:30pm to 4:30pm at Setsugekka East Village. You can observe his performance and purchase freshly-made wagashi. 12 years ago, Hiromori succeeded his family business and became the 5th master of Ganyuudou as a result of his father’s death. While Hiromori keeps the inspiration and knowledge that were inherited through generations, he has been trying to make his wagashi also something new. Successfully accepted by people in Japan, his new wagashi and its technique has been demonstrated in places, starting in Tokyo. He also continues to visit other Asian countries, such as Singapore, as a step to familiarizing wagashi abroad. The watashi he makes, not only has the tastes and feels of Japan, it has his unique coloring and original shaping that attract people with any cultures or lunguages. Ganyuudou was founded in 1871 by a samurai warrior from the Iwamura domain (currently Iwamura town in Gifu prefecture). The warrior abandoned his samurai status, moved to Hamamatsu, and became a master of a sweets shop. The shop is named after this warrior’s old domain, which can also be read as Ganyuu. The second master of the shop didn’t have a child to take over the business. Thus, he adopted the third master and this master completed the unique flavor of its sweets that has been carefully passed on through the forth generation to the current fifth master. What the third master particularly emphasized in his style was the concept of “morning fresh sweets”, making them in the morning for enjoying the same day. They sincerely hope the customers enjoy our fresh, handmade, sweets made from our heart. This traditional recipe has a timeless taste inherited from past generations and lasting until now. 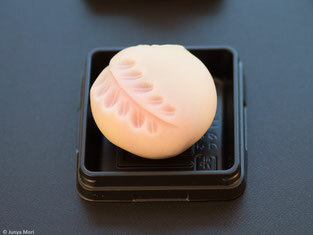 Rooted in a deep love of nature and seasonal changes, the unique aesthetic of the Japanese people gave birth to wagashi, which then reached its present maturity during its long history. So deeply bound is wagashi to daily life in Japan that there is a confection for almost every seasonal festival and every milestone in an individual's life. The principal element of wagashi is an, a bean paste which is made of beans and sugar. In particular, azuki beans are a defining ingredient, without which wagashi can hardly be conceived. Its hearty flavor goes without saying, and its reddish color has associations with ancient beliefs that red wards off disaster and disease. The beans are cooked with sugar, then mashed, and finely strained to produce a smooth azuki bean paste called gozen an (koshi an), or, by leaving some of the solid bits of the beans intact, it becomes a whole azuki bean paste or ogura an (tsubu an). These two pastes are the mainstay of watashi, while other beans, such as the white azuki beans and the white kidney beans, are used to produce a white bean paste called shiro an. These different bean pastes become the basis for the wide variety of wagashi.